Students walk by a sign in the Student Commons stating that The Game's show has been cancelled. The Game was scheduled to appear at Algonquin Jan.23. Jayceon Taylor, known more commonly by his stage name, The Game, has been denied entry into Canada for the second time resulting in the cancellation of his Canada-wide tour. The tour was scheduled to begin Jan. 12, with The Game appearing in Vancouver, followed by 13 appearances across the country, including one at Algonquin on Jan.23. The Game’s application for a temporary resident permit was denied on Jan.9. Though an exact reason has not been cited for his refusal, his past criminality and gang affiliations are possible reasons for his visa refusal given that immigration officials frequently bar people with either from entering the country. “It is not a discretionary power, it is a statutory requirement whether someone would be admissible or inadmissible,” said Omar Faiq, an immigration consultant registered with the Immigration Consultants of Canada Regulatory Council. The Game is a convicted felon and a known member of the “Bloods” street gang, having openly bragged about his gang affiliations in songs such as One Blood. Promoters have offered full refunds to people who bought tickets and stated that concert was promoted prior to his visa being granted to satisfy a visa requirement. “Unfortunately, the Canadian government does not allow for a pre-approval process, meaning that a tour must be visibly on sale to prove it is a legitimate tour and legitimate reason to request entry into Canada. Only after these steps are taken can the artist apply for and receive an approval or denial from the government,” stated the International Touring Agency — one of the artist’s many sponsors — in a Facebook post. The Algonquin College Students Association posted a notice on their website addressing the cancellation. Fans weren’t the only ones disappointed by the cancellation. Local promoters were also surprised by the last-minute cancellation. “It was stressful. We put time, money and effort into it. It was almost sold out,” said Brandon Bird, owner of The Diamond Mine Agency, the company that organized the Algonquin show for The Game. 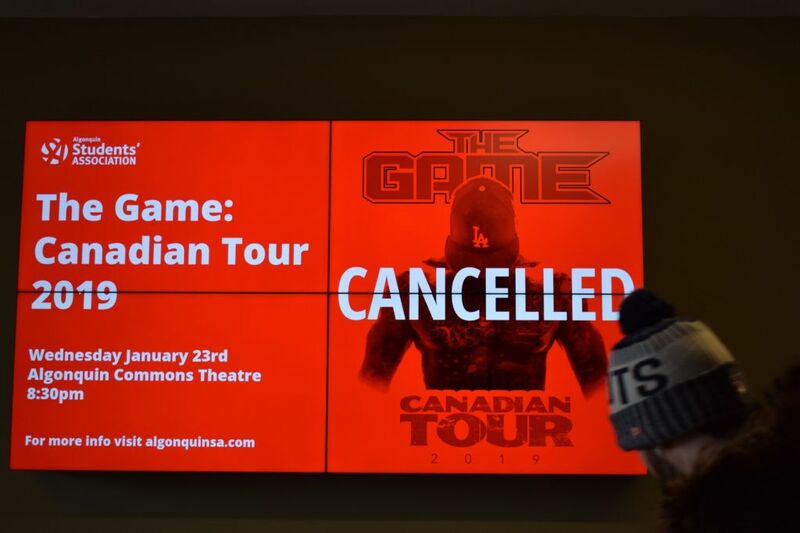 The Game denied entry into Canada for second time; tour, Algonquin show cancelled Reviewed by Qadeer Popal on January 22, 2019 .